With GPS you are able to know where you are, where you’re going, and how to get there anywhere on Earth within 30 seconds. With GPS you are able to know where you are, where you’re going, and how to get there anywhere on Earth within 30 seconds. This means the higher the accuracy the better! 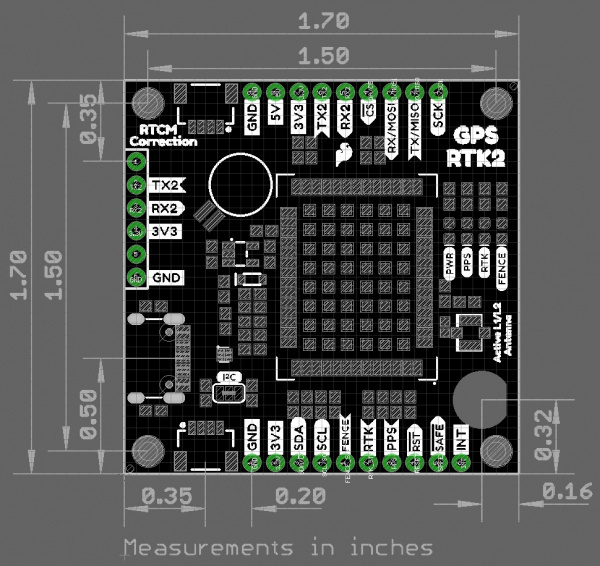 GPS Real Time Kinematics (RTK) has mastered dialling in the accuracy on their GPS modules to to just millimeters, and that’s why we had to put it on this board! The SparkFun GPS-RTK2 raises the bar for high-precision GPS and is the latest in a line of powerful RTK boards featuring the ZED-F9P module from u-blox. The ZED-F9P is a top-of-the-line module for high accuracy GNSS and GPS location solutions including RTK that is capable of 10mm, three-dimensional accuracy. With this board, you will be able to know where your (or any object’s) X, Y, and Z location is within roughly the width of your fingernail! The ZED-F9P is unique in that it is capable of both rover and base station operations. Utilising our handy Qwiic system, no soldering is required to connect it to the rest of your system. However, we still have broken out 0.1"-spaced pins in case you prefer to use a breadboard.